Everything Dinosaur will be stocking the new Eofauna Scientific Research 1:40 scale replica of a Steppe Mammoth (M. trogontherii). The UK-based specialist supplier of dinosaur and prehistoric animal models has been granted exclusive access to this new figure for on-line sales for a British Isles-based company. The beautifully sculpted PVC figure measures nineteen centimetres in length and shows some amazing detail. Team members are currently working on the data sheet that will accompany sales of this model through Everything Dinosaur’s website. As Eofauna Scientific Research is staffed by vertebrate fossil specialists and researchers too, this fantastic mammoth model will also be supplied with a hang tag and bonus collectable card to educate collectors about this geographically widespread, Middle Pleistocene proboscidean! The Steppe Mammoth (Mammuthus trogontherii) was one of the largest of all the proboscideans, with some fossil specimens indicating a bodyweight in excess of ten tonnes. 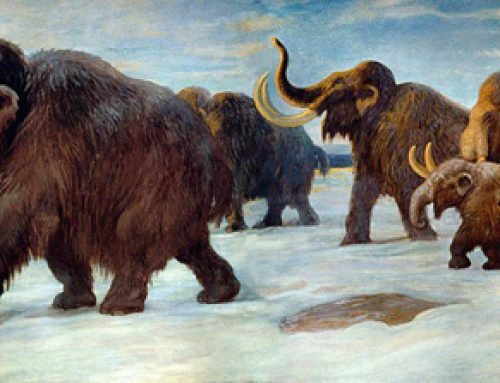 This mammoth was an evolutionary intermediary between the ancestral mammoth M. meridionalis and the better-known Woolly Mammoth (M. primigenius). It evolved around 1,600,000 years ago and roamed much of the northern latitudes of Europe and Asia. The elephant’s skull was shorter than those of its ancestors, this is skilfully depicted in the anatomically accurate 1:40 scale Eofauna replica and the teeth of Mammuthus trogontherii were adapted to feeding on tough grasses and sedges – check out the superbly painted upper molars that are visible in the open mouth of the model! Coming Soon to Everything Dinosaur! A 1:40 scale model of a M. trogontherii by Eofauna. This is the first of an exciting range of PVC models, the range is being introduced with the aim of giving fans of prehistoric animals and model collectors the opportunity to build up a collection of highly accurate, museum quality figures. If the 1:40 scale Steppe Mammoth is anything to go by, then collectors and prehistoric animal fans are going to be roaring with excitement as this new range is rolled out. Just wait until you see the dinosaurs…. The museum quality Eofauna Steppe Mammoth replica. The model is likely to be available from Everything Dinosaur in September (September 2017).